It is not that we do not know we are primitive. We know it but we aren’t doing anything about it, and there is no effort about doing anything about it. You talk to any first time visitor to the Caribbean from Guyana and he/she will tell you, whether it is in St. Lucia, Bermuda, Nevis, Jamaica or any other island, once you mention you are from Guyana, there is a subtle change in facial expression that gives off the distinct impression that Guyana is not seen in positive ways. This country simply does not move. Why? I don’t know. We can come up with theory after theory, but fifty years from now, another columnist, with a similar cynical mind, will write in the same vein as this columnist here. That will happen because we haven’t progressed the past fifty years; what makes anyone think we will in another fifty. We live in the 21st century, and I am reading about change in sentence rather than in the essence of the law relating to possession of marijuana. For possession of 15 grams, the charge is trafficking. It is not only the possession of 15 grams of ganja that carries a trafficking charge, but you get arrested and charged for the possession of one gram. Can anyone imagine the stupidity of a country that charges people for possession of one gram of marijuana? (see my column of December 7, 2015, titled, “Eureka! Eureka! Someone discovers a law,” about a lady named Taite from Sandy Babb Street, Kitty, charged for possession of one, yes, one gram of ganja as reported in this newspaper of December 5, 2015). To think that there ruling politicians who do not want to change this section of the law. No wonder foreign people frown on us. Caribbean people know how backward we are and they laugh at us. GECOM’s boss Dr. Surajballi replied to me when I wrote about three drivers that did not get their money from GECOM since May 2015. I chose not to reply but my point was that in a small population like Guyana’s, we do not have large numbers, so public service delivery should not be a protracted process. In yesterday’s edition of this newspaper, a teacher wrote that when she enquired about her application for a teaching appointment, she was told there are applications from 2013 still being processed. The lady went on to lament the long, long time it takes to get a reply. And for what? A teaching appointment in a country where there is a dire shortage of teachers even at the most prestigious schools. How do you explain this delay given our small population? In that very issue of Kaieteur News, another writer bemoaned the excessively long wait for a birth or marriage certificate. This is coupled with the fact that applicants are not told within what time frame, they can expect to receive their document. One must remember at all times, when we read about these manifestations of bureaucratic insanities, they are occurring in a country with a small population just over 700, 000. What words and concepts can one use to describe this country? The President made the front page of the Chronicle describing the draconian dress code at governmental institutions as a thing of the past. Two weeks after he said that, a prominent citizen wrote in the newspaper that the dress code sign is still up at the Cultural Centre. You can call it disrespect for the President. But there could be another description- a country without sense and sensibility. On Friday, the Acting Police Commissioner told a reporter that the police will be monitoring the situation with the unnecessary random traffic stops. He was quoted in the press as saying this. The very next day, on Croal Street around 3 30 PM, I saw junior traffic ranks conducting random stops. The people at the Cultural Centre didn’t ignore the President. The junior traffic ranks on Croal Street didn’t ignore the Acting Commissioner. 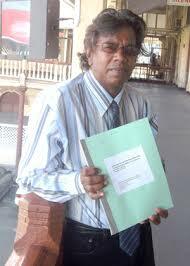 The realistic situation in Guyana is no one gives a damn about anything, about anybody. That is why people laugh at Guyana.